For the second year, The Harvey School is pleased to support the Musical Therapy Program at Northern Westchester Hospital. 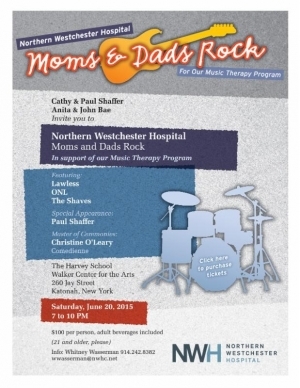 Northern Westchester Hospital Moms and Dads Rock in support of our Music Therapy Program, an evening of music and dancing, will take place on Saturday, June 20 from 7 to 10pm at The Harvey School. $100 per person, adult beverages included (21 and older, please).Please click here to purchase tickets.